For your informaton purposes, I did this image in Scrapblog and then I used Photobucket to get it this large size. My son, his girlfriend and I went to the beach yesterday and we had a wonderful afternoon. We were just hanging out and having a good time and of course I was taking pictures. I love the first one of my son. I applied some black and white out technique on him alone but it is not very effective. You can't really tell if his image is black and white or not. His girlfriend has such beautiful clear facial skin. I just had to crop a picture of her to just get her eyes. Awesome!!! I have been wanting to learn this feature for a while. I thought it would have been some thing very complicated. But I did this using Photobucket. I am so excited about this. I have done it! In my attempts it reminded me of when I did Art as school. Art was one of my favorite subjects. My next objective is to do step by step instructions on how I was able to do this touchup. That will take some time. So I will do a part two to this post. Stay tuned!!! I had a lot of fun with this photo this morning. I used Photobucket to add the frame around the photo and the little symbol over the cats head. As you can see the cat is having a nap at his 'pad'. A tree house for a cat!!! He has the best view on the property, he could see the ocean and anyone who enters the property. Awesome!! But he is resting right now so do not disturb!!! LOL!!! I will like to take this opportunity to post about a blog that I recently found. The blog is about blogging tips and I have done some really great things since I started reading this blog and I have only just begun. The large image below is one of the tips. Based on one of the tips I was able to upload this large picture in my blog and was directed to PhotoBucket where I was able to do some really fun things with this photo. This picture is a close up shot of my weddings rings. The sapphire ring is really not swirly like that. I applied some effects from Photobucket. So check out Sneaky Momma Blog Designs for all your blogging tips. Five large stars to you Sneaky, Great Job!!! My son showed me this picture this morning and it took me a long while to figure out what the picture was about. I could identify the sun but that was all. After many guesses, I remember that he had just returned from his trip to Trinidad and it occured to me that he took this picture from the plane!! Awesome!!! To actually see this view with your own eyes is just breath taking!!! A few days ago, as I left my apartment and approached my vehicle, I noticed this blossom. I was so pretty. Now this is a wild bush and I wondered why I did not see this blossom before. Apparently this shrub blossoms occasionally and I had the opportunity to 'see' it that morning. I took this picture this evening and am really pleased with the results. The housekeeper was discarding the coffee dregs from the peculator so I followed her to see what she was going to do with it. She threw it by the plants, so I thought that she was providing fertilizer for the plants. But with the same thought, I said to her that did not know coffee was used for this purpose. I know that the contents from the tea bags are used to fertilized the plants. 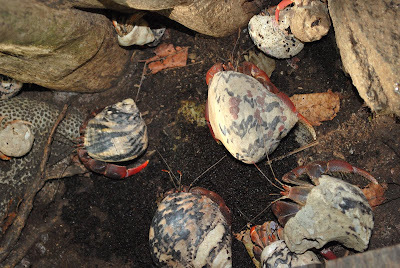 Her response to me was that the coffee dregs was for the crabs. 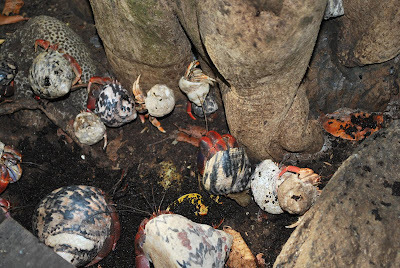 As she turned her back, within seconds and I mean literally seconds, these crabs started to crawl out from under the wooden floor. I was amazed! Plus I nave never seen this type of crab so large. 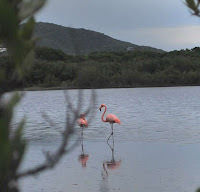 These pictures were taken when my son visited Anguilla last year. When I first saw picture number one, I could not identify what he had in his hand. In the picture, he was just standing there with his hand streched out. So I asked him what is so special about this picture, what was in his hands. Then he told me that he was feedings the birds!!! AWESOME!!! 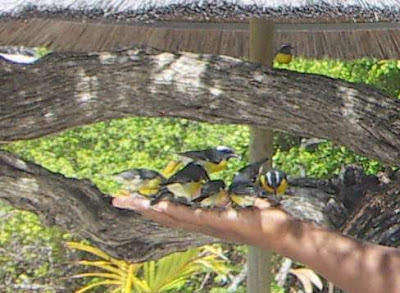 I cropped the picture so you can really see the birds on his hands! Apparently these birds are accostomed to being feed by people. They are so pretty. 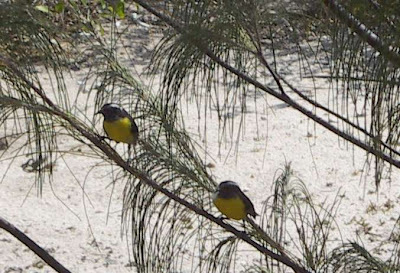 A few mornings, I noticed one of them paid me a visit when I was hanging my clothes on the clothes line. I was so happy to see it. A rare sight indeed! 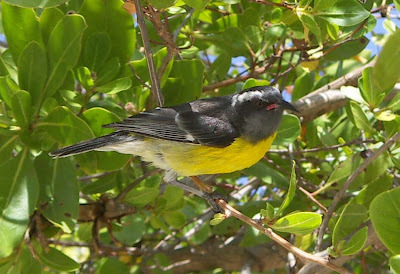 The name of this bird is BANANAQUIT aka Yellowbreast, Banana Bird. I had to drive all the way to the western side of the island to get this shot. I think if I had gotten there a little earlier, I would have gotten the sun now starting to 'set'. I found this photo in my stock file, I had taken it some time ago with cell phone. I like this one the best. 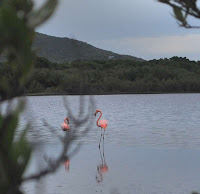 This time I did not have to go to the Western End of the Island, this location was about a 8 minute drive from my home. The BVI is presently in its hurricane season. We were on hurricane watch for the past two weeks, for Anna, Bill and Erica hurricanes. 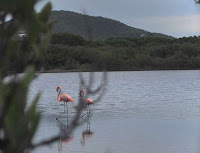 During this period, one the biggest charter companies in the territory, park their boats in this lagoon. 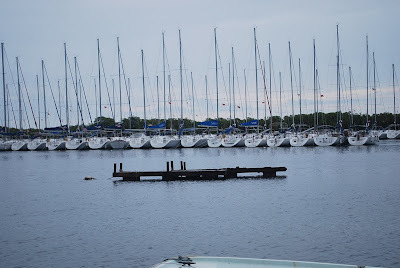 Its is basically a safe haven for the yachts. 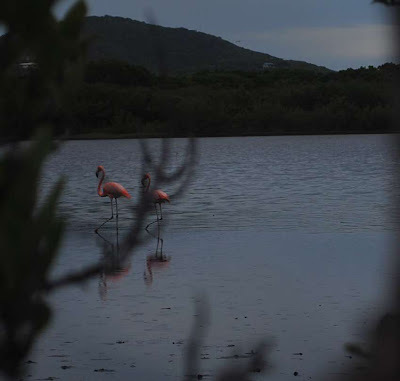 The lagoon is completely surrounded by mangrove trees. The swells from the ocean do not enter into this area. You may be thinking that these pictures were taken in the evening around 6:30pm, well it was the total opposite. I took these pictures this morning (5th September 2009 at around 8:30am. What happened was I had my camera set on automatic therefore my camera was focusing on the trees that were in front of me. 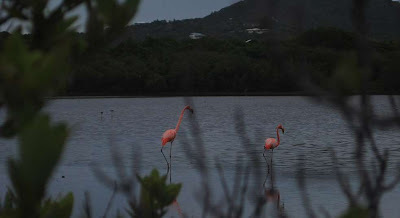 You see these birds were in a pond on Beef Island, British Virgin Islands. It is a rare site to see them there. The pond is surrounded by mangrove trees. I tried to get as close as possible until I reached a point where the soil under my feet was very soft - like quick sand. I had to reset my camera to manual settings - I did not adjust anything else. I was so excited! Thus the reason the pictures look like they were taken in the evening. I used this website to crop these pictures. I discovered that I could adjust the lighting (with my camera) on my photos after they have been taken. These are the results and then I cropped them (using the online cropper above). I got the inspiration for this photo from one of the blogs that I follow. 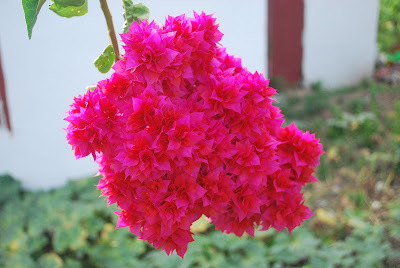 A few days after I read the blog, I saw this beautiful bunch of bougainvillea flowers. I can't remember if I ever saw the flowers in a bunch like this. They look absolutely gorgeous! 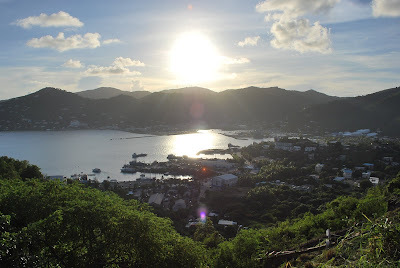 I had a mini plant once but as I had to migrate to Tortola BVI, I gave the plant to my mother. It was in a lovely champagne shaped vase. She loves flowers, plants so she took her usual good care of the plant. Everyone one in the neighbourhood is always complementing her about the plant. They are really lovely when they are in full bloom. Take a look at my comment to the post .